1. Cut eggs in half lengthwise and transfer yolks to bowl. 2. Combine Smoky Paprika Chipotle, mayonnaise, salt, and pepper with yolks and mash with the back of a spoon until fully mixed. 3. Using a zip top bag with one corner cut off refill the egg whites with about 1 tablespoons of the mixture, mounding slightly. 4. Sprinkle top with Smoky Paprika Chipotle if desired. Can be made ahead of time and kept chilled until serving. 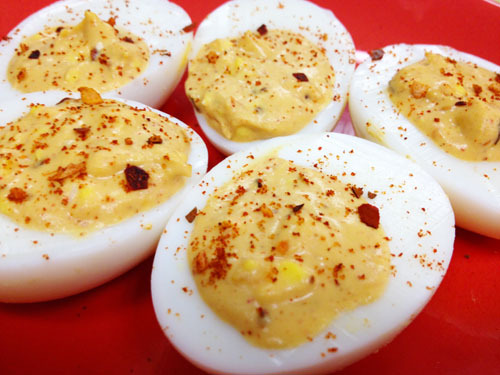 For a great hard-boiled egg place eggs in single layer in a pot and submerge with cold water. Turn heat to high and bring eggs to a boil. Once water is rapidly boiling turn off heat and cover the pot. Let eggs sit in pot for 15 minutes for medium/large eggs and up to 20 minutes for extra large eggs. Plunge eggs into a bowl of ice water for 10 minutes. Crack the egg under water at the larger end where there is an air pocket. Peel egg under lightly running cool water.